We recently ran a feature about ABBAINTER.NET and the trouble they had with someone starting a youtube channel and using Philippe’s work, now they have taken art work from our site ABBAOFFICIAL.COM and are using this as their wallpaper. 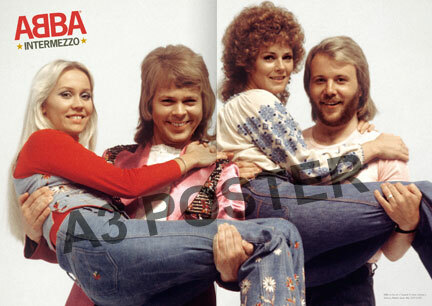 We have not given permission for this, nor have Universal given permission for them to use the official ABBA logo. Please note the ONLY site for ABBAInter.net is via Philippe page. 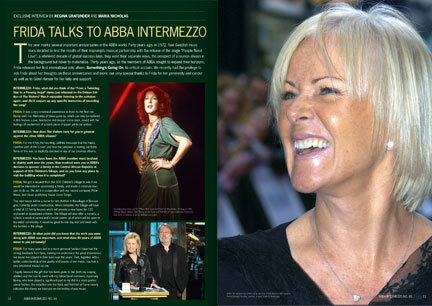 He works very hard to give great stuff to all ABBA fans and we ask that you support his site and not the fake one. The legendary bite sized candy M&M’S® announced today that MAMMA MIA! is now the only Broadway musical whose logo visitors to the M&M’S® store in Times Square may custom print on their special chocolate buttons. All “Big Apple” souvenirs should taste this good! Mars Retail Group unveiled a new personalized printer at M&M’S® World New York, which allows guests to create customized M&M’S® right in the store. Visitors can select from a variety of images and create customized messages that will be printed on M&M’S® Brand Milk Chocolate Candies in about two minutes. Guests can choose from 15 different colors and one mix blend, as well as select two images and create two customized messages to feature on their personalized M&M’S® blend. In addition to MAMMA MIA!, people will be able to select from images including the “Big Apple,” “I Love NY,” the Statue of Liberty, as well as the New York Giants, New York Jets, New York Yankees and New York Mets logos. Each M&M’S® Brand Milk Chocolate personalized blend will be available in 10 oz., 12 oz., 16 oz. and 32 oz. containers starting at $19.99. Now celebrating 10 smash hit years on Broadway, MAMMA MIA! is one of the most successful musicals of all time anywhere in the world and is now 10th longest running show in Broadway history. Seen by over 50 million people around the world, MAMMA MIA!, is celebrating over 4,450 performances at Broadway’s Winter Garden Theatre and remains among Broadway’s top selling musicals. The current North American Tour has played over 4,000 performances in over 175 cities with 150 repeat visits. The original West End production of MAMMA MIA! is now in its thirteenth year and has celebrated over 5,000 performances in London and the international tour has visited more than 74 foreign cities in 25 countries and been seen by over 4.3 million people. The blockbuster feature film adaptation of MAMMA MIA!, produced by Judy Craymer and Gary Goetzman, is the most successful movie musical of all time grossing $600 million worldwide. Owe Sandström is the world famous designer who created all the magnificent costumes worn by Swedish super group ᗅᗺᗷᗅ. On Tuesday 17 July, Owe will be at Kronberg’s Ateljé in Skansen open air museum – where ABBA’s last studio album cover Visitors was shot in 1981. He will talk about how the costumes were made and he will also bring along some unique ABBA memorabilia. Kronberg’s Atelje is open 11 AM-4 PM. Later in the evening Owe Sandström and The Original ABBA band will take part in the TV show Allsång (Sing-A-Long), broadcast live from the Solliden stage at Skansen. Besides being ABBA’s costume designer, Owe Sandström directs Stockholm International Horse Show, works as a safari guide in Kenya and is the founder of Sweden’s largest animal care education center. Comments : Comments Off on Crazy about ᗅᗺᗷᗅ’s costumes? 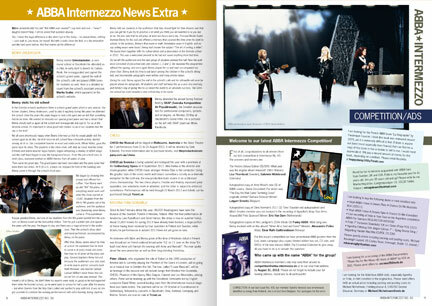 Frida has given an exclusive interview for this issue!